Superior machine performance through expert bearing solutions. Tilting pad journal bearings are designed to operate under a wide range of conditions of speed, load, load angle, oil temperature, and oil viscosity. Each one of these variables has an effect on the oil film, and an influence on whether the film is laminar, turbulent, or in transition. Other design parameters affect the film as well including geometry such as the bearing diameter, length, clearance, preload, the number of pads and their orientation. A Reynolds Number (Re) of 1000 is typically used to distinguish whether the flow in the oil film is laminar or turbulent. A bearing behaves as expected in either of these flow regimes. For example, pad temperatures tend to increase with speed. Operation through the transition region, however, can lead to behavior that does not appear normal. This can be explained using the following graph which plots pad temperature data from recent tests conducted on Kingsbury's new tilting pad journal bearing test rig. Referring to the 8 gpm [30 l/sec] data, pad temperatures are noticed to increase with speed from 100 to 200 ft/sec [30 to 60 m/sec] and from 250 to 350 ft/sec [75 to 105 m/sec]. These represent laminar and turbulent film flow, respectively. In the transition between 200 and 250 ft/sec [60 to 75 m/sec], however, pad temperatures decrease with speed. 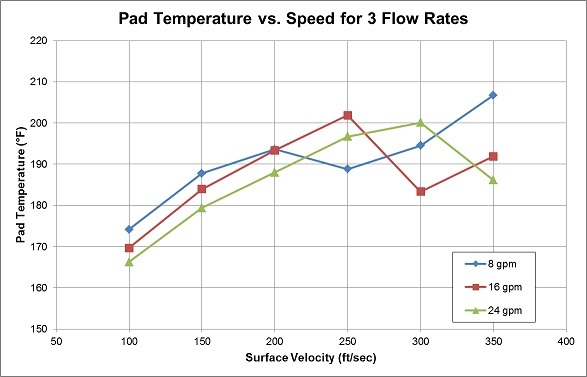 The decrease is attributed to the turbulent flow's capability to better remove heat from the pad surface. Also in the graph, it can be noticed that pad temperatures decrease as expected between for 100 and 200 [30 to 60 m/sec], and again at 350 ft/sec [105 m/sec] data as oil flow is increased from 8 to 16 to 24 gpm [30 to 60 to 90 l/min]. At speeds between 200 and 300 ft/sec [60 to 90 m/sec], however, results are somewhat reversed. For example, pad temperature increases significantly as flow is increased from 16 to 24 gpm [60 to 90 l/min] at 300 ft/sec [90 m/sec]. Where: l is length; p is unit loading, C are the constants. For a given bearing geometry at constant speed and load, the film thickness (h) varies with the square root of viscosity (√γ), while the Reynolds number varies indirectly with viscosity (1/γ). Combining the equations, we find that Reynolds number varies by 1/(√γ) for a given bearing geometry at constant speed and load. For the above example of increasing pad temperature between 16 and 24 gpm [60 and 90 l/min] at 300 ft/sec [90 m/sec], increasing the oil flow rate cools the oil films thereby increasing the viscosity. This gives a smaller Reynolds number or, in other words, a higher transitional speed before turbulent transition. The higher flow in this case resulted in a change in the film from turbulent to laminar flow with higher associated temperatures. Based on the equations and data, it can be deduced that the increased flow rates keep the bearing in laminar operation longer, increasing the threshold speed before turbulent transition. Operation in the transient area may lead to unexpected results, so it is important know where the transition occurs. If you are experiencing behavior of this nature, we encourage you to consult our sales engineers for advice on developing a retrofit bearing to address the specific needs of your application. Please call us at +1-215-824-4000 or send us an e-mail via sales@kingsbury.com.